NEW YORK — The 2013 World Intellectual Property Organization treaty on access to published works for print-disabled readers may go into effect by early 2016. And the treaty has become part of a bigger process at the United Nations on the rights of persons with disabilities, speakers at UN headquarters in New York said this week. The awkwardly named 2013 Marrakesh Treaty to Facilitate Access to Published Works for Persons Who Are Blind, Visually Impaired, or Otherwise Print Disabled provides for copyright exceptions in national laws to allow print-disabled persons to get accessible format publications, including across borders. The treaty has been ratified by eight nations. It takes 20 ratifications for the treaty to enter into effect, and many countries are making progress with the help of stakeholders and WIPO, officials say. 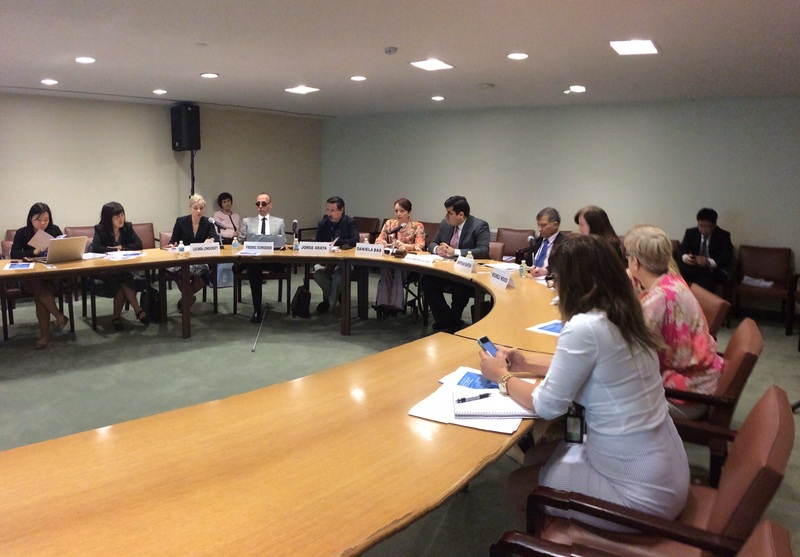 An event entitled, “Looking forward from 2015: Realizing the rights of persons with disabilities,” was held on 10 June, and focused on the Marrakesh Treaty. The panel was a side event to the 9-11 June Conference of States Parties to the Convention on the Rights of Persons with Disabilities. Michele Woods, director of the WIPO Copyright Law Division, on the panel gave the WIPO view that the UN agency is “cautiously optimistic” they will have the necessary 20 ratifications by the end of 2015. Speaking at the event, a Mexican official said his country is very near, and a parliamentarian from Thailand said it is trying to be among the first 20 as well. After 20 ratifications is reached, there is a three month period until the treaty enters into force, according to Woods, so observers are hopeful this will happen in early 2016. A late June meeting of the WIPO Standing Committee on Copyright and Related Rights (SCCR) might provide an opportunity for some members to announce ratifications, based on past experience. Woods said groups like the World Blind Union (WBU) are working hard on moving countries toward ratification. Member states are eager to get the benefits of the treaty for their citizens, she said, and proponents will keep working even after the treaty goes into effect because it is more effective as it gets more signatories. 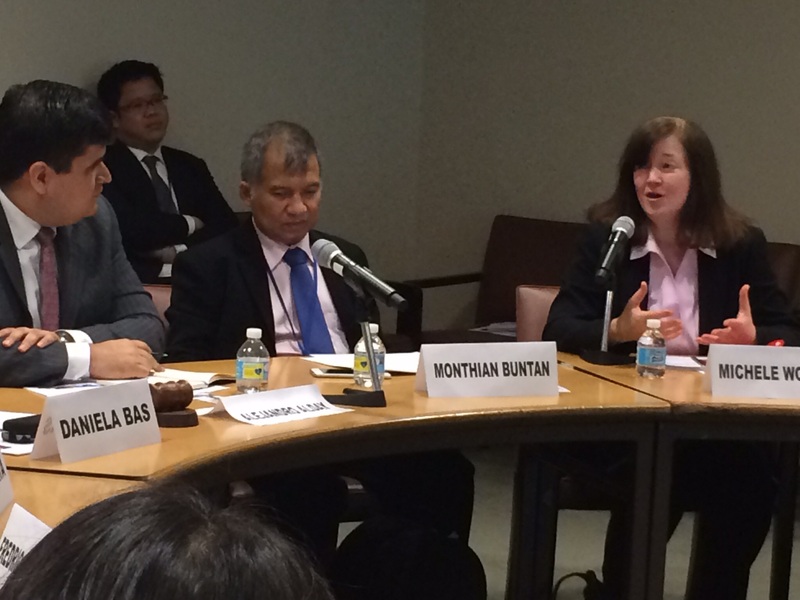 “We want this treaty to be as successful and relevant as the UN Convention on the Rights of Persons with Disabilities,” Daniela Bas, director, Division for Social Policy and Development, UN Department of Economic and Social Affairs, said on the panel. The WIPO Marrakesh Treaty “will be a strong complement” to the rights of persons with disabilities, she said. This should be kept in mind as the UN Sustainable Development Goals (SDGs) are approved, followed by the global Development Agenda of the UN, she said. “There is a need to ensure that the relevance of this treaty is well understood,” Bas said. For instance, it should be known how the Marrakesh Treaty can help alleviate poverty, a top goal of the draft SDGs. “Information is power, and the Marrakesh Treaty gives people power,” she concluded. An official from Mexico, filling in for Alejandro Alsay of the Ministry of Foreign Affairs, called the Marrakesh Treaty a “ground-breaking instrument.” It is an example of complementarity between human rights and intellectual property rights, he said, and opens the door to thousands of additional consumers and readers. Because of the success of the Marrakesh negotiation with so many stakeholders involved, it offers an important lesson for what delegations have ahead of them now at the UN. And it relates to many issues, such as disability, information, culture, and society, he said. On 3 April, the Mexican Senate approved the treaty. The country expects to conclude the ratification process in a “very short time,” he said. Woods, meanwhile, said interest groups need to work together to implement the treaty. “There are a lot of people doing a lot of work across a lot of fora,” she said, including member states, non-governmental organisations like the World Blind Union, and UN representatives such as those working on rights of persons with disabilities. Woods said the effects of the Marrakesh Treaty include that it encourages WIPO members to adopt copyright exceptions in their laws to accept special formats of published works for visually impaired persons. Definitions include a variety of reading disabilities, she noted. Another aspect of the treaty is to allow cross-border exchange of materials. The concept of exceptions has been in laws since the beginning, said Woods, but the treaty includes a specific requirement of members to allow cross-border exchange of materials. That is “more unique,” she said. There are such exceptions out there, but they are rare, so the treaty will have the effect of tying provisions together. Woods said many member states are asking for assistance and advice. Laws need to be brought into conformity in order for them to ratify the treaty. Many laws had some exceptions but sometimes not as wide as the treaty, she said, or they don’t allow cross-border exchange. Events have been held in regions on both the Marrakesh Treaty and 2102 Beijing Treaty on Audiovisual Performances in order to inform key stakeholders in member states, Woods told Intellectual Property Watch. Events have been held in locations such as Singapore, the Dominican Republic, and Uganda. But WIPO is thinking about the fact that implementation will be based on languages, which run cross-border, so events will also focus on that. Sometimes language groups are in neighbouring countries, and sometimes they are spread across continents. For instance, there is an initiative from the WBU partnering with the government of Brazil focused around Portuguese language, bringing in African countries. A meeting will be held in Cabo Verde on 13 June. There are hopes to have a similar event with Arabic-speaking countries, Woods said. The workshops are aimed at creating networks, encouraging local institutions. Pilot programmes have been undertaken as well, Woods said on the panel. These aim at accessible format books in local languages that may not be reached by cross-border exchange. The goal is to provide textbooks in local languages to students who might not otherwise be able to participate in education. The programmes are also providing access-format readers, and software. “We’re moving well beyond what we’re used to in copyright field,” Woods said, touching on broader UN efforts for persons with disabilities for instance. Pilot programmes have been launched by the Accessible Books Consortium (ABC) in locations such as Bangladesh, India, and Sri Lanka. People are trained at the local level to make accessible format, working from the ground up for practical implementation. Once the treaty comes into force it could facilitate some works coming across borders, especially in local languages, she said. ABC, a joint effort of WIPO, the publishing industry, and NGOs, “aims to increase the number of books worldwide in accessible formats – such as braille, audio and large print – and to make them available to people who are blind, have low vision or are otherwise print disabled, according to their website. Event moderator Lucinda Longcroft, head of the WIPO Coordination Office in New York, noted that WIPO is the only self-funded UN agency and the majority of those funds go toward technical assistance and capacity building. Another speaker from the national perspective was Monthian Buntan of Thailand, a member of the National Legislative Assembly of the Thai Parliament and a member of the Committee of the Convention on the Rights of Persons with Disabilities. Buntan talked about what means to be able to read and how it fits with the general principle of the Convention on the Rights of Persons with Disabilities (CRPD), which is accessibility – the “backbone” of the agreement. Effective implementation of the CRPD treaty is critical, he said. Thailand had an exception in copyright law since 2006, he said. The country adopted the Marrakesh Treaty in 2013. He was then motivated to revitalize the copyright law in Thailand. But he was in the Senate, where in Thailand one cannot introduce legislation. The last year, with the military coup, the Senate was dissolved. He was placed in the Assembly, which gives him the ability to introduce bills. With the cooperation of the Ministry of Commerce, they introduced same text as in 2006, and it went through smoothly. They passed the copyright amendment law last year, and it came into force in February of this year, he said. He noted that the national law provides for access to “copyrighted” works – not just “published” as in Marrakesh – for the benefit of persons with disabilities and without seeking profits. How it will be done and who can do it will be done in the Ministry of Regulation, said Buntan. That is how the law works, he said. They write a very short law and then the Ministry of Regulation writes the details. That was done and it is now in force. The Thai princess is a champion of disabilities and of print disabilities, and the government want to celebrate her 60th anniversary this year with ratification of the Marrakesh Treaty, he said. “We just have to look again at whether our law is in compliance,” said Buntan. The law allows for reproduction and modification for persons w disabilities, but does not mention “distribution”. He said he does not know if this will create problems with the treaty provisions on cross-border exchange. If so, there will have to be another amendment. He said he hopes Thailand will be among the first 20 countries to ratify Marrakesh. He noted that the distribution discussion is not about how the end users can have access. That is a question of how technology comes in, he said. But they will have to go through the whole cycle from production to how materials will be consumed by end users. Buntan also said that accessibility is “still a relative term” and that there is no universal term for it. He encouraged coming up with internationally recognised standards for accessibility that allow for differences to be recognised. Locally available technologies allowing access to accessible materials need to be developed. Thailand has developed a homegrown delivery system which is open source and ready to be shared with the developing world, he said. Now they have a streaming multimedia technology that allows the user to see the text, hear it and other options, based on internationally recognised standards. It is not new, he said, but just a compilation of what exists put into accessible format. “We need to have the most accessible, available and affordable way” possible, he said. Frederic Schroeder, first vice president, World Blind Union, Geneva discussed the importance of ratification. “If you do not have access to literacy, the opportunity to be productive and employed as an adult goes down” dramatically, he said. Of adult blind people in United States that have jobs, 90 percent use Braille, he noted. Schroeder pointed to provisions to consider at national level. He encouraged governments to leave out the provision on “commercial availability”. It sounds like common sense, he said: if commercially available in an accessible format cannot be produced again for the blind or visually impaired. It sounds like something that would protect rights holders. But the problem is in situation where there is no commercial availability requirement, typically government and small NGOs produce these works. “If I set up a small NGO to produce those materials, you don’t want them worrying about litigation,” he said. He gave the example of a book that is available on recorded CD, such as Tolstoy’s War and Peace. It is commercially available, has been recorded. Does that mean it is commercially available in accessible format? What if the book sells for $15 but the CD collection for $60. Is it really available in any meaningful way, especially for a person in a developing country? He asked. Or what if the user is an academic who needs to see the construction of the sentences, is Braille available? “Commercial availability is a concept that adds complexity but doesn’t protect anything,” Schroeder said. He discussed recorded books, noting for instance, if it is available, it could be useful if you just want a child to access the story, but if want them to learn to read, you need the book. And libraries might not exist, so direct distribution is important, he added. “This is huge for blind people” in terms of opening up material that was not available or only to a certain degree, he concluded. An official from Singapore spoke and added the country’s support for the treaty. She said Singapore acceded to the treaty this year. The key element is to allow import and export of materials, she said. It is difficult in market like Singapore to be commercially viable so this treaty becomes important. Processes are in place to protect the original integrity of the work. Works are not easily obtained in commercially available format, she said. Jorge Araya, Secretary of the Committee on the Rights of Persons with Disabilities, at the UN Office of the High Commissioner for Human Rights (OHCHR), highlighted three points. He called for a dialogue with the committee, which is already asking member states how they plan to implement the Marrakesh Treaty. He also raised reaching out more to parliamentarians. It is important to have a collection of best practices of countries that have already ratified treaty, he said. Third, they should look at how they broaden their partnership, for instance with other UN partners, like the UN Educational, Scientific and Cultural Organisation (UNESCO). Araya also recommended tying the Marrakesh Treaty with the efforts for persons with disabilities across the UN. “It’s a tool for development,” he said. "WIPO Marrakesh Treaty In Force By Early 2016? Now Part Of Bigger UN Process" by Intellectual Property Watch is licensed under a Creative Commons Attribution-NonCommercial-ShareAlike 4.0 International License. Dr. Schroeder mentioned above: And libraries might not exist, so direct distribution is important, he added. Canada’s recently submitted its C-65 to Parliament to amend Copyright Law in conformance to the Marrakesh Treaty. — (ii) a person with a print disability, in a country other than Canada, who has made a request to be provided with, or provided with access to, the work or other subject-matter through a non-profit organization acting for the benefit of persons with a print disability in that country. So the Canada revision mentions direct distribution via an NGO and the Marrakesh Treaty provision for direct distribution mentions no such NGO.